Posted on January 13, 2017 by Matthew Leib. This entry was posted in Spotlight, Staff Stories and tagged Coaches' Corner, dare to do, Spotlight, staff story. Bookmark the permalink. 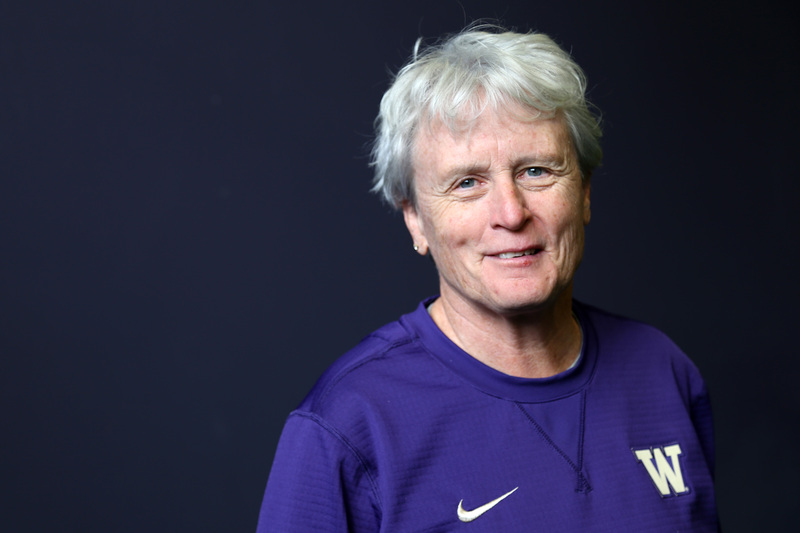 Even after 33 seasons as head coach of the University of Washington women’s golf team and a 2016 run to the program’s first national championship, Mary Lou Mulflur is quick to shoot down any notion that she has it all figured out. Mulflur, who was recently named 2016 NCAA Women’s Golf Coach of the Year, sounds like she’s just getting started. In her world, there are only new narratives—and that’s coming from the only coach to have attended every PAC-10 and -12 championship since the inception of a women’s conference tournament in 1987. “Every year you start with a blank canvas and, no matter what you do, every year is different,” she says of golf’s particular way of producing any possible scenario or outcome. It’s the nature of the sport Mulflur first played as an eight year-old with her father, a Portland sportswriter. One of the perks of his job was a golf club membership, so when he wasn’t covering games on weekends, he’d head to the golf course and ask if anybody wanted to come along. One of eight children, Mary Lou always leapt at the opportunity. Mulflur continued to play golf throughout high school and during summers before becoming one of the first women to receive an athletic scholarship at the UW, joining the women’s golf team in 1976-77, then in its third year under its coach and founder Edean Ihlanfeldt. Upon graduating, Mulflur says she considered playing professionally before deciding to pursue a career in real estate. Within a few years, however, the coaching job at UW had opened up and the sport was calling her back. Over that span, little has remained constant besides what Mulflur describes as her “love affair with this University” and the golf program’s underlying fundamentals. Coaching a sport where so much depends on individual performances comprised of countless concentrated actions demands a unified approach, which, for Mulflur, is mostly mental. If it sounds Zen, it kind of is. Mulflur dedicates three minutes to meditation at the beginning of many practices, while volunteer assistant coach David Elaimy holds an optional mindfulness class each Thursday at the Golf Performance Center. While the common adage might be to “train smarter, not harder,” for Mulflur and her squad, it’s about training smarter and harder, only for less time. It might stand to reason then, that for a national champion coach, Mulflur doesn’t play much golf herself. “I play maybe twice a year,” she says of the rare round she plays with the team or with her 90-year-old father and 16-year-old son. Right now, she’s focused on the spring season ahead. January finds her organizing the team’s two-day winter retreat, during which time she says she plans to draw focus away from last year’s championship. So what does define them? For Mulflur, it’s a mission. “We’ve never forgotten our purpose, which is education,” she says, citing the approach of athletic director Jennifer Cohen and a network of coaches, including Chris Petersen, Lorenzo Romar, and Mike Neighbors, whom she views as “beacons” of an education-first attitude. For Mulflur, a winning outlook is earned as much as learned. She says one goal for the upcoming two-day retreat is to reemphasize the golf program’s culture of work, grit, and toughness—rebalancing her athletes’ hard-earned right to revel in their national title with the hard-nosed determination necessary to compete for it again in a field of more than 260 teams this spring. She say’s it’s part of what helped the team become champions in the first place. The team mantra for 2016 was be comfortable being uncomfortable. “I make my players do the impossible,” she says of a penchant for assigning difficult-to-complete drills. Mulflur describes one exercise in particular—what she calls the bunker game. Another drill involved holing a bunker shot, holing a short pitch shot from five yards out, and then sinking a 50-foot putt. But a little visualization goes a long way. The entire team finished in 45 minutes. Two players holed their first bunker shot. Over 34 seasons, so has she. She describes the state of mind she and the team strive to attain as one of effortless effort. Mary Lou will deliver a motivational talk on goal-setting Tuesday, January 17 as part of The Whole U’s Seattle campus Dare to Do Kick Off celebration in the HUB North Ballroom. Learn more about our expert-led 2017 Dare to Do New Year’s Challenge here.